Go the extra mile with the right tires at the right price, from Firestone Complete Auto Care. We're your local tire shop in Homewood, AL! 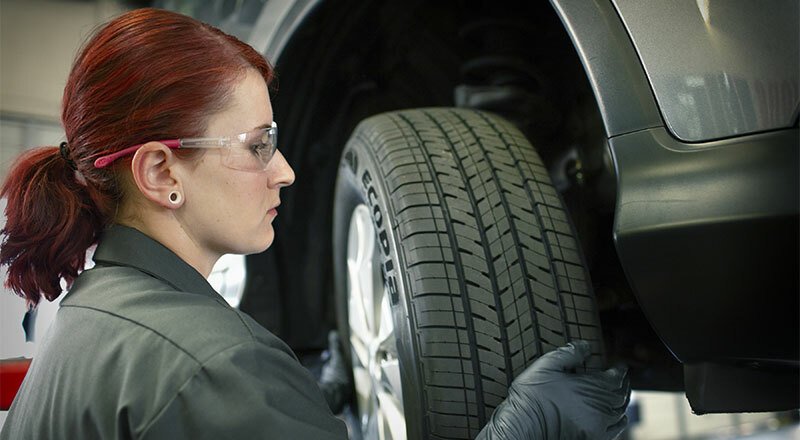 When it's time for new tires, Homewood Firestone Complete Auto Care is the best place to go. It doesn't matter whether you drive sports car or a family-friendly minivan, you’ll find the right tires for less. We'll help you pick the best tires for your budget, lifestyle, and climate. Explore our robust inventory online and shop tires from trusted brands like Bridgestone and Firestone. You can even book your tire installation online, too! From run flat tires to eco-friendly tires, Firestone Complete Auto Care is the tire place for you! How do you know when your tire wear has gone too far? Our qualified technicians are ready to take look, but you can do a little research in your driveway too. Start by checking your tread wear. If the tread is shallow and worn, your tires may have trouble gripping the road. That's a red flag! You'll also want to look for bulges, tears, bumps, or sidewall cracks, and note your tire age. Your tread may look A-OK, but vehicle manufacturers generally recommend you replace your tires every six to ten years. It can be matter of staying safe on the road, a main priority for us at Firestone Complete Auto Care in Homewood. Chart a course towards adventure or a more fuel-efficient commute with the best tires for your car from Firestone Complete Auto Care. You'll find the size you need from brands you trust, including Bridgestone, Firestone, and Primewell. Trust us with your wheels and you'll get much more than professional installation and advice. We'll also provide you with complimentary tire pressure refills and tread checks, along with quality flat tire repair, rotation, and alignment. We've been one of Homewood's tire shops of choice for a long time, and a leading tire provider in the U.S. for close to a century. For quality service at spectacular prices, turn to Firestone Complete Auto Care. Browse tires online and schedule your installation today! From oil changes to engine tune-ups to tire repair, rely on your nearby Firestone Complete Auto Care for your car or truck maintenance and repairs. We're your local car care center, tire store, and automotive shop combined into one. Our highly qualified technicians work hard to help keep your vehicle performing its best. When you bring your car or truck to us for maintenance, we promise affordable prices and exceptional service. Experience the difference and book an appointment online for auto service in Homewood, Alabama today.